Today I spent the day in a classroom...it just wasn't mine! One of my favorite teaching buddies (well actually she's an awesome friend in and out of a school setting) moved to a new school. She was with me at my last school and we often helped each other out. No need for that tradition to end just because we are on new campuses! It was fun chatting as we sat on the floor cutting out laminated stuff and helping her plan her classroom setup. I was glad she was able to feel much more settled in her room by the time I left. We'll be checking out another teacher store tomorrow and using my Cameo machine to cut out of bulletin board titles. Have I mentioned how much I love that thing?! This was our proudest creation today! She picked an owl theme and had a basic idea of what she wanted, just wasn't sure how to execute it. These colored sheets are going to be the background for her students' work to be displayed. Write names with a Sharpee marker. This makes it so you can use Expo (dry-erase) spray to erase the names if students move away or classes get adjusted in the first couple of days of school. No need to redo the whole wall! Same goes for name tags if you teach with a migrant population like I have in the past. I'm convinced school walls, or maybe the fade-less paper aren't exactly straight! We hung the borders in straight lines, and some paper hung out on the sides/bottom. To fix the problem, slide an open pair of scissors or a razor blade gently along the edge of the border. The thin strip of excess paper cuts right off! Her walls have cracks in them and sharp scissor slide easily down the line for a perfectly straight cut. Work can be hung and exchanged easily using a small binder-clip held on to the wall with a push pin. Putting the pin at a downward angle helps keep the clips from blowing off if there is a breeze through the doorway. 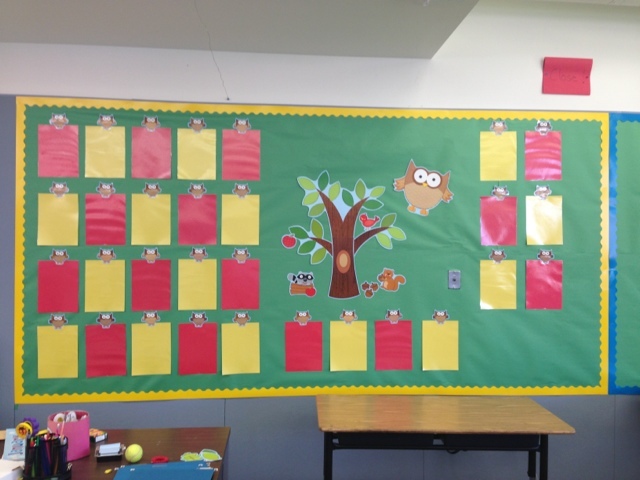 I love setting up bulletin boards! Oh, and desk/furniture arrangements! What's your favorite part of setting up a classroom?